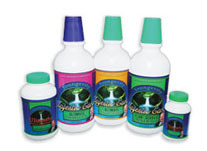 Immu-911 applies a complete strategy for the immune system by offering an array of balanced, specific, targeted nutrients such as Colostrum, Beta-1, 3-D glucan, Mycelial mass mushrooms, Astralagus, Echinacea, Vitamin C, Zinc, and Pau D'Arco. 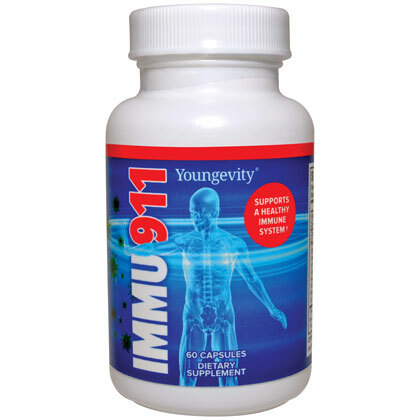 Immu-911™ applies comprehensive nutritional support for the immune system. Immu-911™ contains an array of balanced, specific, targeted nutrients, such as colostrum, beta-1, 3-D glucan, mycelial mass mushrooms, astragalus, echinacea, vitamin C, zinc, and pau d’arco to support healthy immune function. * SUGGESTED USE: Take one (1) capsule, twice a day. WARNING: If you are pregnant, nursing, or taking medications, consult your healthcare professional before using this or any other product. KEEP OUT OF THE REACH OF CHILDREN. 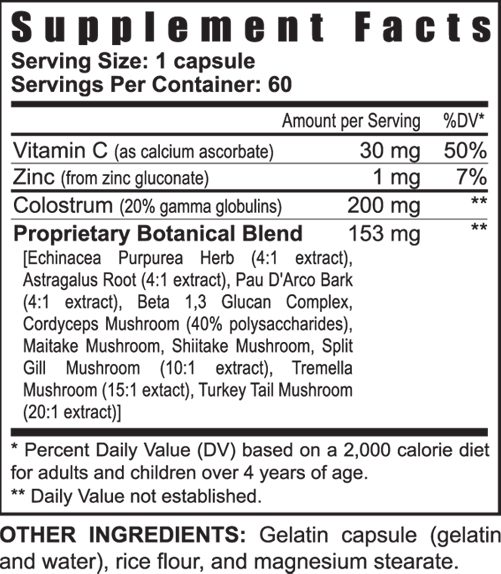 Ingredients: Vitamin C (as calcium ascorbate), Zinc (from zinc gluconate), Colostrum (20% gamma globulin, Proprietary Botanical Blend, [Echinacea Purpurea Herb (4:1 extract), Astragalus Root (4:1 extract), Pau D'Arco Bark (4:1 extract), Beta 1,3 Glucan Complex, Cordyceps Mushroom (40% polysaccharides), Maitake Mushroom, Shiitake Mushroom, Split Gill Mushroom (10:1 extract), Tremella Mushroom (15:1 extact), Turkey Tail Mushroom (20:1 extract)], Gelatin capsule (gelatin and water), rice flour, and magnesium stearate. Immu-911 applies a complete strategy for the immune system by offering an array of balanced, specific, targeted nutrients such as Colostrum, Beta-1, 3-D glucan, Mycelial mass mushrooms, Astralagus, Echinacea, Vitamin C, Zinc, and Pau D'Arco. Many of the factors in this unique combination actually nourish the immune system, making it stronger and better able to perform it's life-protecting functions. Facts About Supporting Your Immune System. A strong immune system is necessary to stay healthy. The immune system is your body's final line of defense against all forms of illness; without a strong immune system, the body is weak and vulnerable to disease. By combining a variety of factors and supporting the immune system from various angles, we can stimulate the immune system, while feeding and nourishing it at the same time. Through this multi-faceted approach, we not only increase immune response but ensure that the system remains healthy and ready for the next job that comes along. - Vitamin C is a natural anti-pathogen and can destroy virus and bacteria on contact. - Zinc deficiency is directly associated with impaired humoral and cellular immune response, including T Cell response and thymic hormone activity. - Colostrum contains antibodies, immunoglobulins and other immune enhancers to support a healthy immune system. - Beta-1, 3-D glucan activates and readies macrophages for their critical function of consuming both foreign and waste matter within the body. Beta-1, 3-D glucan's other benefits include antioxidant and free radical scavenging properties, protection against radiation, helping to heal ulcers, and it is one of the most powerful transfer factors presently known. Mushrooms have been used for centuries to enhance the body's natural defense mechanisms and for their ability to ward off disease. Certain strains of mushrooms, when concentrated, can produce profound immune response (and when grown on rice bran, their immuno-properties are magnified many times). Echinacea has historically been used in the support of a healthy immune system. Astragalus is the cardinal herb used in Chinese medicine to tone and feed the immune system, with emphasis upon the lungs. It is also routinely used for spleen deficiency and edema. Pau D'Arco is known for its powerful properties. Take 2 capsules every four hours for 3-5 days in times of cold, flu, or other infection, or as directed by our health care professional. As part of a maintenance program, take one capsule once or twice daily.